It’s hard to describe how I am feeling today. I am not really ok, but I know I am not ok, so I think that cancels out me not being ok. I have taken two doses of the hormonal therapy, tonight will be my third. Already, I am wondering how much this reduces my chances of a recurrence and whether it is worth continuing. The one thing I can say for sure is that I noticed yesterday I seemed anxious and on edge and was very tired. Today, I had a great lesson. We went through and added more details to the solo and most of it I was able to pick up and incorporate. We did a full run-through to finish the lesson, and I was beat, so my balance was a little off, but nothing show-stopping. But when I left the studio, I felt discouraged, anxious, and upset after my lesson and I have NO reason to feel that. Everything is fine–but I want to have a breakdown because of a few balance issues in one run-through. And that my shoes are wrong. And that there is still no ending. And that I did everything ‘small’. And that…. I could tell from the beginning of my lesson that my confidence is down. I am struggling to look up and look at myself in the mirrors, which I haven’t struggled with for a few months. I was putting much less energy into the expressiveness of the dance. I was lacking enthusiasm. All of this, is unusual for me. I have been here before–as I have mentioned I have had other issues with hormones before breast cancer that left me an emotional, irrational wreck. I guess this time, I have been expecting it, so that is why I am recognizing it. I am trying to tell myself to relax and that it will be ok, but I am not getting very far. I am almost more upset that I AM upset because I know I shouldn’t be. The scary thing for me is that this could only be the beginning and I am not quite sure when it will end. Probably around when I stop taking the pills for my surgery–this time around. Then again in March once I start up taking them again after. It could be that I am just tired, combined with everything else. I was up a little earlier today than usual for a meeting, so I got less sleep last night. I am still very much feeling side-effects from radiation. I have new sections of raw skin, even though the old ones are healing. It’s only been a week and a half since I had my last treatment, so those side effects are still coming to their peak. To be honest, I am having a hard time figuring out if I am lacking in energy, motivation or both right now. I am definitely dancing less. I haven’t done my exercises in almost 2 weeks, although I have done some practice on my solo, and a little bit here and there in my living room. I sort of really don’t want to do much of anything right now–it all seems like it just takes too much energy. When I finished my lesson today, I could tell I was done. I tried to talk myself into staying to do a little bit of practice, or my very basic rocking exercise and just couldn’t do it. I could feel myself being emotional and knew I didn’t really have any reason to feel that. I gave myself a break. I have very little scheduled for the rest of the week, so I am going to give myself permission to just relax. I don’t have a lesson tomorrow night, so I will go to the studio just to practice. I think knowing in advance that I don’t have a lesson tomorrow was helpful in making the right decision tonight. I am looking forward to practicing tomorrow and working through some of the details from my lesson tonight on my own–and I see that as a good sign! I will be practicing during a young kid’s class, so the studio will be separated with curtains, so I will have a small space to myself. I think I need that. I think I need that time. I hope the next few weeks won’t be up and down like this. I am a very rational, calm and level-headed person normally, so I don’t deal well with seeing myself being irrational. I think one of the reasons I started this blog was to help me get through this time and deal with these emotional side effects. When I type out the things I am feeling, it is easier to see how much they don’t really make sense. It just helps to ‘get it out’ some times. I can see why there doesn’t seem to be a lot of people talking about their experiences on hormonal therapy. I think if I hadn’t had issues with hormones previously, I would have no idea really that it is the HT that is affecting me–probably I might think I am having some sort of breakdown, or worse, I might actually give in to the anxiousness and panic and make rash decisions. For now, I am coasting on this. I will let Boss know that I am dealing with these sorts of issues and that I AM dealing with them. I know he would rather I talked about it a little at a time, than to let it fester and grow into a huge deal. I guess that is what I am really most scared of. That as I go through these side effects I will stop dealing with them positively and rationally and I will forget to ‘talk it out’ in little bits at a time. All I can do it see how it goes and keep making myself take the HT. It’s temporary and I will be ok.
Keywords for jive are energetic, fun, flirty, spontaneous, and playful. Jive is definitely the most energetic of all the latin dances and definitely has a style all it’s own. There is no wonder why it is the last competitive dance as it certainly shows a couple’s endurance, and it is almost the complete opposite character of the dance the precedes it–Paso Doble. It’s a pretty versatile switch. Jive is a dance to liven things up. It is hard not to enjoy yourself watching or dancing a jive. There is a fun spontaneity about it that just keeps you on your toes. You almost never know what might pop out of a jive. Because it is a quick dance, there is a really flirty, playful aspect to it. Communication between partners is key and there is so much turning, spinning, bouncing and swinging you just can’t help but be drawn in. It can be pretty intricate but absolutely marvelous when both partners are completely in sync. Personally, I love the challenge of jive because it has a technique all it’s own and requires so much energy because of it’s speed. It’s one of those dances that just seems to flow from one step to the other because there isn’t time to think about what you are doing–you just go. The best part of jive is just letting go and letting loose with all you have. Slowly my energy is coming up–I don’t think I am imagining it! I was able to practice for 1/2 an hour after my lesson today. Not much, but more than last week. It was good because I was able to work out some of the pieces in the solo for the competition. We still don’t have an ending, but in the meantime, Boss keeps ‘upping the ante’ on the things we do have. We were able to run through it twice today without stopping, although we had a minor hiccup in that some of the new choreography is one bar too long. Easy to fix on Wednesday. I am pretty impressed with myself as we move through this solo. Boss keeps asking more from me and I keep being able to respond to the requests. For me, at least, it’s a whole new level of working with a partner. Yes, he is the teacher, but there is a feel of collaboration and I don’t feel like I am just along for the ride. That’s a good feeling. The solo seems to be in a good place right now. I will only have two lessons this week but that’s ok with me. It means on Thursday I can practice at the studio on my own and really work out the things from my lessons today and Wednesday to be ready for next week. I have competitive practice this weekend, but I think we are only doing the latin routines so I can see where my endurance is. I hope I will be able to wear a full bra for that because jive without one might not go so well. The skin under my arm seems to have almost finished peeling, there is one spot left I can see of dead skin. I hope this means it will start healing over the rest of the week. It’s pretty raw and painful right now. Almost the end of September and 3 weeks until the competition. Time is moving quick! It’s been a while since I posted as I gave myself a good break and have been dealing with skin issues. My skin seems to be progressing well. The spots where is separated under the breast seem to be healing and closing, and my collarbone is looking a little more normal. The big problem from the weekend is under my arm where they were radiating the lymph nodes. The skin broke in a huge area there and it hurts and pulls whenever I move my arm. It is still in the peeling phase and I can tell the area is going to be even bigger tomorrow. But once I get past the peeling, it takes about 3 days to start feeling better. So strange as it seems, I am hoping it will finish peeling today so I can feel better by the weekend. There is one part of my treatment that I haven’t mentioned too much, and that I haven’t really seen anyone mention outside of forums and that is hormonal therapy. Not everyone does it as your cancer has to be susceptible to it which is determined by the tests they do on the cancer they remove. It’s a simple enough therapy, I take a pill once a day for the next 5 years. No regular hospital visits or needles, just a pill. Like a birth control pill–only the birth we are preventing is a cancer reoccurance. Some breast cancer cells have receptors on them that allow them to seek out and feed on specific types of hormones (estrogen and progesterone). With these receptors, the cancer cells essentially use these hormones to feed themselves and reproduce and grow more cells. When removed cancer cells are looked at under a microscope, the number of receptors on each cell is counted for each hormone and if they are present (not all cancers have them), a percentage is given based on how many. My tumours were 100% Estrogen receptor Positive and 80% Progesterone receptor positive. That makes me a strong candidate for hormonal therapy as the main ‘food’ for my cancer was my own hormones. From what I understand, the hormone therapy suppresses the ability of certain cells (most of which are female-type cells) to use estrogen. It keeps the estrogen from attaching to the receptors on the cells (whether healthy or cancercous), therefore cutting off a big part of their food supply. It also keeps my body from producing extra estrogen and suppresses my ovaries. It basically creates a form of temporary menopause, and like menopause will come with it’s own set of side effects. The main ones are fatigue, nausea, hot flashes, muscle soreness, and moodiness. The good news is that the body should usually adjust to the treatment after approximately 3 months and the side effects should lesson. I remember something similar when first starting to take birth control pills many many years ago. The only hiccup (besides having to get through 3 months of unknown varying side effects), is that the pills can also put you at a high risk for blood clots. This means that I will have to stop taking it 3 weeks before my surgery to clear it out of my system and avoid that complication. It also means I will have to start taking it again once my plastic surgeon determines I have healed enough from my surgery to be able to do so, and the clock on the side effects starts over. Unfortunately, because of the length of time between radiation and my surgery, my oncologist didn’t feel it would be safe for me to wait to start the hormone therapy until after. I do get some similar lasting benefit for a while after chemo, but it is temporary and that is running out, so I have no choice but to start/stop/start again. I am trying to stay optimistic that perhaps I won’t have hardly any side effects from this therapy, there are some people who do experience that. I just know I have a bad track record of hormone issues, so that makes it harder to be so optimistic. All I can do right now is take the pills and see how it goes. I seem to be a little perkier today and in slightly less pain. I am cautiously optimistic that maybe things are slowing down and starting to take a turn for the better. Fingers crossed. Had 2 good lessons today and yesterday. We are continuing to work on the solo and getting into the details and styling a bit more. We have about 15 seconds left to choreograph and we have gone from rumba to samba to paso, so I am eager to see what we end with. I can do almost the entire thing on my own, minus the pivots and even they aren’t too bad. I even managed to practice on my own for about 40 minutes today, which is more than I have done in a week and felt great. I was able to work through the solo routines and get through the parts I needed to do on my own. Boss gave me a few more things to work on, and we worked out the timing a little more solid, so I hope to have the energy to practice tomorrow to keep things fresh. I am really enjoying working on this solo. Boss has really given me some good challenges through it and it is really making me stretch my boundaries. He is using a different approach for this solo, but I couldn’t describe it really. I think it is because he is using the music to drive the choreography. It just really works. I look forward to seeing how it will end. Until then, I remain cautiously optimistic. I gave myself a day off. I sat at home and refused to let myself leave for any reason. I read. I watched tv. I worked on finishing a cross-stitch I have been doing for a while now. I just took a breather. Yeah, my skin is a little worse today as expected. Especially around my neck it is peeling bad and it is starting to pull tight in places. I can’t seem to find a comfortable way to rest my neck. But nothing unexpected, and I can tell I will be going to bed early tonight. I will be back at it again tomorrow with a lesson and I hope a little bit of practice, and I am optimistic tonight will be some restful sleep. I see the dentist on Thursday, and I have to say I am worried. You are not allowed to see the dentist or even floss while on chemo because of the risk of infection and I decided to wait until after radiation to set up my annual appointment. Up until now, I have had almost perfect teeth and been really lucky. I don’t think that luck is going to hold out on Thursday. I am pretty sure that the chemo has caused some damage to my teeth as they feel pretty sensitive. On top of the chemo, I spent almost 5 months drinking water mixed with lemon juice because I couldn’t tolerate drinking plain water. The acid from the lemon juice probably didn’t help. But I will see how things go on Thursday. For now, it’s still my day off. My skin separated in places today and started peeling with a vengeance in others. I had to start taking stronger pain meds at night because I can’t tolerate the feeling of the sheets rubbing on my skin. I feel like I just keep coating myself in creams for no reason. The problem is that all of this will get worse before it will get better. I have been told that, I expect that. My main goal is to try as hard as possible to keep all the sores from getting infected. Sounds easy enough, but I have a feeling it’s not so simple. Almost all the places they have treated are prime areas for sweat. And I can’t wear a bra anymore. Yeah, that was a conversation I was hoping not to ever have to have with Boss–the we can’t do jive or samba for a few weeks because I can’t have my girls bounce too much conversation. Thank goodness for email. I can tell that practice is going to be few and far between the next little while too. My plan to try and practice on the days I don’t have lessons to keep things in small bursts instead of large blocks at a time. My main focus is the solo we are working on. It’s almost completely choreographed now. About 30 seconds remaining to do. Boss has really upped the ante on me with this solo and making me work hard. Had a small mishap today doing pivots where I caught the far outside edge of my foot and slipped and fell. Almost took Boss down with me. It was a gentle fall, nothing hurting, but it shook Boss up a bit. We stopped working on the pivots and moved on for a while. We were able to run from the beginning through until we run out of choreography 3 times without stopping, so that is a good achievement for today. I am really enjoying working on the solo, and it is giving me something to look forward to each day and is a great challenge. It is the bright spot in my misery. Misery is temporary. I am tired, emotional and I hurt. But, it’s what needs to be. For now. For another few weeks. Then I will be ok.
Today was another competitive practice. After the first two dances in standard, I was really thinking I should have just skipped it. I had no gas to keep pushing myself, I kept forgetting routines, my frame was awful and at one point I told myself to pull it together and the answer was that I didn’t actually care. I kept forgetting the routines. I don’t think I have had a worse practice. But I rallied. I did manage to run through all 5 standard dances twice (except only once for Viennese), and making small adjustments I actually improved over the last couple dances. Then I got through all 5 latin routines (although jive was very hard to finish) really strongly with all the details Boss and I have been working on, and even had a little power for Paso. That was a good sign and a good way to finish. I think my next practice, I will be doing latin only because that is what I am doing at the competition and we need to have an idea of what my endurance will be like when I haven’t tired myself out doing standard first. The heat lists are out for the competition! I am doing my solo first at about 10 am, then I have a break until around noon. I will finish competing around 9 pm. I just found out my competition in the open latin is last year’s Ohio Star Ball pro/am Latin champ for our age group. That just makes it really a learning experience and a chance to have fun doing my silver routines. As Boss says–“let’s just win the audience!”. It will be an honour to be on the same floor with her. Next week should be focused on finishing the choreography for the solo, so I am looking forward to that. The little bit of ideas Boss showed me that he is thinking for the end is exciting and I am interested to see what that actually translates into on the floor. 4 weeks to go! I hope to see you all there soon!! More posts to come as I work my way through the radiation side effects, prepare for my surgery and a competition this fall! And radiation treatments are done!! I wish the side effects went with them though. It’s ok, now the clock is ticking–about 2 more weeks of worsening side effects, then slowly I should start feeling better. 10 weeks from now until my surgery. Tick tock, Tick tock. Really glad now I decided to do the competition in October. I look at the stretch of time before me until my surgery and it seems a little endless, although likely it will get here faster than I am ready for. It was definitely a good idea to have something else to focus on this fall. The fatigue has really been getting to me lately and I haven’t been able to practice as much as I would like. I didn’t do any practice Wednesday or Thursday as I could tell I was doing well to get through my lessons. I did spend 45 mins at the gym today going through the first part of the solo we have worked out. I am pretty confident we will finish choreographing it next week. Boss seems to have a pretty good idea what he wants to do. He is really stepping up the game for me on this solo. I have multiple spiral spins and free spins and I do a lot of dancing on my own. He is also adding some definite gold steps. I just hope my energy levels over the next couple weeks don’t drop too much, so I can keep working the steps out. I gave some thought to costuming for this solo, and came up with all black with a ‘stoned’ pink ribbon pinned to the chest. Nothing fancy, just very simple and telling. Sent the idea to Boss for approval, so I will see what he says. The solo is to Rachel Platten’s ‘Fight Song’ which pretty much defines my life for the past year. The entry list for the competition is out, and as expected I have no one to compete against–however, if I drop an age category for the open latin, there is one other couple there, so Boss is asking the organizer if we can switch. All in all, it’s pretty anti-climatic to finish radiation. 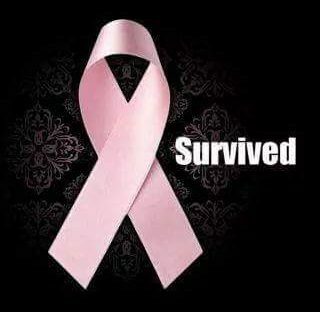 I don’t think it has quite hit me yet that both chemo and radiation are done. I am now only one big step away from being cancer-free–which is a clear pathology report after my surgery in November. Fingers crossed!